Occupying this position within the company since the year 2015, Alexander’s duties include providing opinions on the registrability of trademarks, he drafts objections to numerous provisional refusals and responds to office actions. 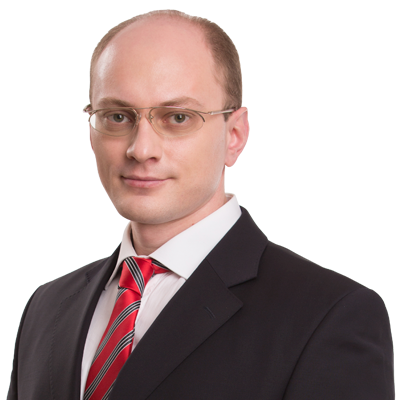 Alexander has an expertise in the procedure of recordals of IP objects with the Customs Register. Where he was a Junior Specialist in Ferrous and Non-Ferrous Metal Foundry Engineering. In 2007 he went on to the Kyiv International University (Ukraine) and became a Specialist in International Relations, International Affairs Politologist, Translator/Interpreter of Farsi and English. In 2016 he became a Specialist in Economic cybernetics at the Institute of Alfred Nobel University Dnepropetrovsk. Presently Alexander has a second Masters in view at the Institute of Intellectual Property of the National University of Law in Kyiv, in Intellectual Property Management. His extensive work experience includes serving as a diplomat at the Ministry of Foreign Affairs of Ukraine, focusing on protection of rights and legal interests of the Ukrainian citizens abroad at foreign posts such as: The Embassy of Ukraine in the Federal Republic of Nigeria where he was the Attache, Third Secretary, and The Embassy of Ukraine in Australia where he served as the Third Secretary on Consular Affairs. All of this between 2008 and 2014. Alexander is an expert at handling all types of trademark cases. He is also skilled at the preparation of the full set of documents required for filing lawsuits on trademarks cancellation and termination of trademark rights violations. In his spare time Alexander enjoys reading Cognitive Sciences studies.